I LOVE sewing up gorgeous appliquéd t-shirts. They’re so easy to make and look so cute. They also make perfect gifts and are a great scrap-busting project! 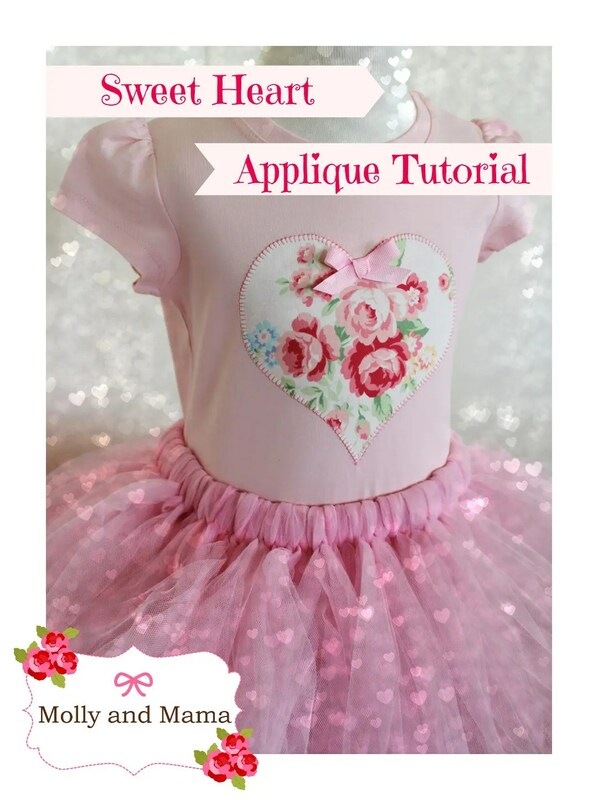 Here’s a step-by-step guide to sewing this sweet heart appliqué project at home. 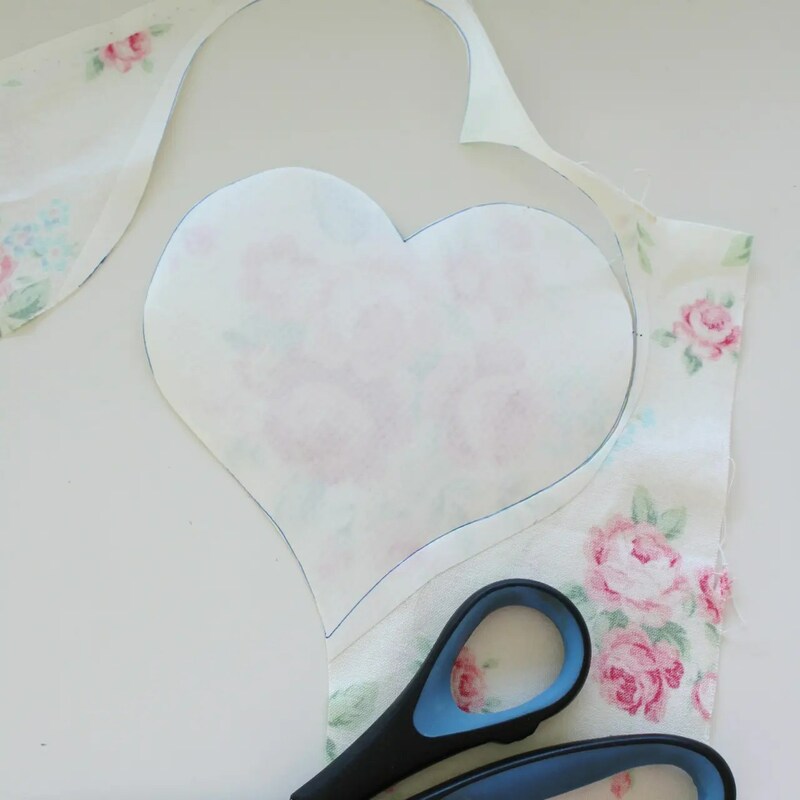 If you’re after more appliqué tips, be sure to check out this similar post HERE and download the free ‘Little Deer’ Appliqué template. 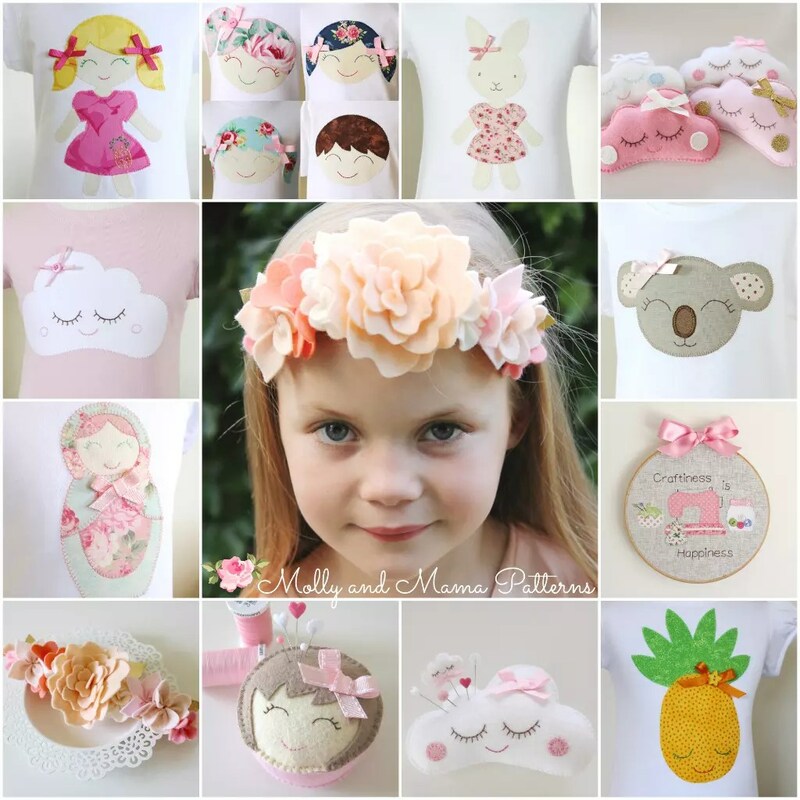 I also sell a really cute range of instant download Appliqué Templates HERE. These patterns are more than just templates. There’s full instructions, images and more. And the range is always growing. But let’s get back to our sweet little project. A heart template. You can use the heart I created which I included below. Save it to your computer and print it to a size that suits your project. Then you can use it whenever you need it. Feel free to draw your own template too. This tutorial will work for any symmetrical shape. Ribbon for a bow if you wish. 10mm wide ribbon is easy to work with and grosgrain ribbon washes really well. Be sure to read the tutorial from beginning to end, before commencing your project. 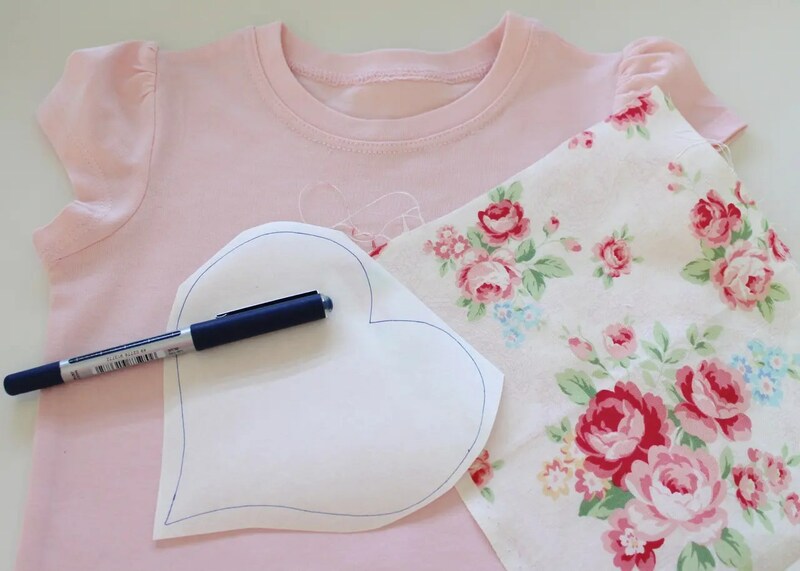 If you haven’t tried appliqué before, make sure you practice using some fabric scraps first. Take your time. And enjoy it! All of my appliqué projects use a ‘blanket stitch’. I find that this stitch gives a great finish, and longevity for the appliqué. 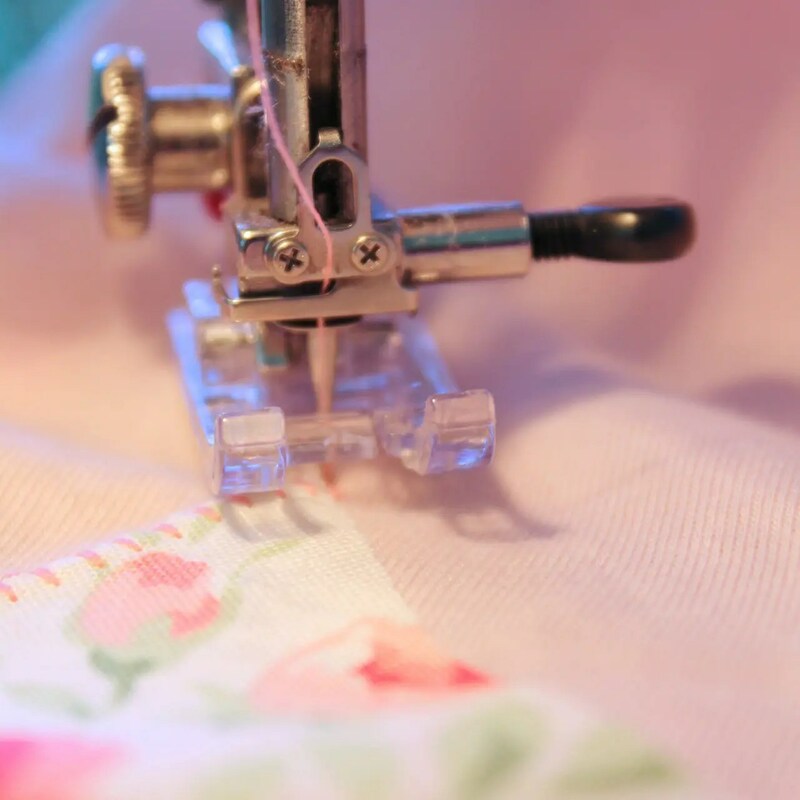 Many sewing machines will have a blanket stitch setting (which is what I use). 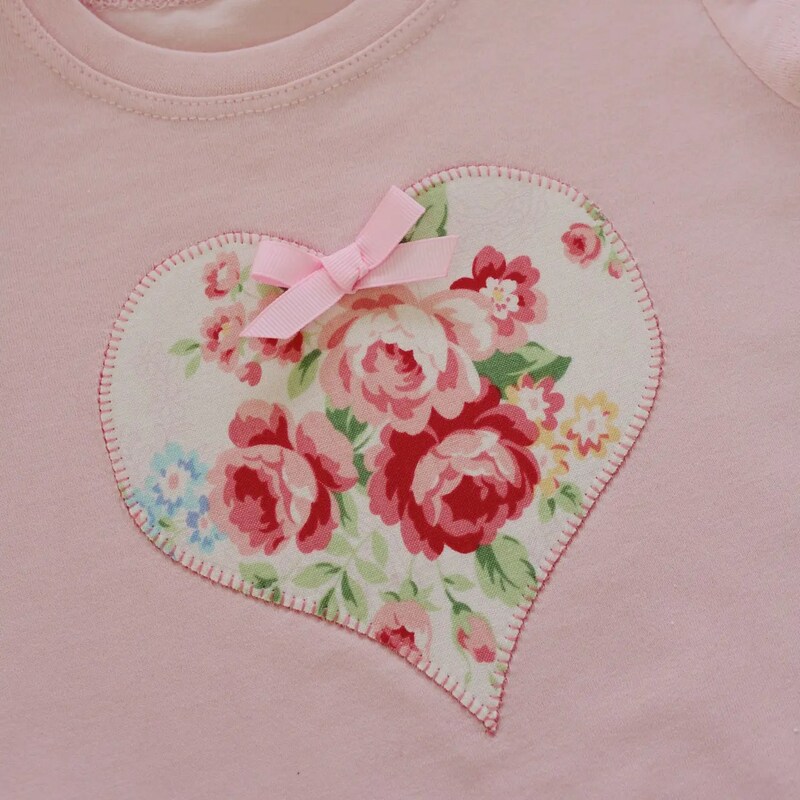 Alternatively, you can hand stitch and embroider your appliqué. If you are new to hand stitching, a quick Internet search brings up lots of videos, images and tutorials for different stitch types. Apart from blanket stitch, you can also use a straight stitch, or tight zig zag (satin) stitch. For this project I have used a heart design I created a while back. Simply right-click the template to save it. Or download it to your computer HERE. Then print it on your home printer. To make appliqués that are larger or smaller, just enlarge or reduce the template size by changing your printing settings. So that I always have a ready template, I traced the heart shape onto some clear plastic to make a solid template. I cut it out so that is easy to trace around for future projects. 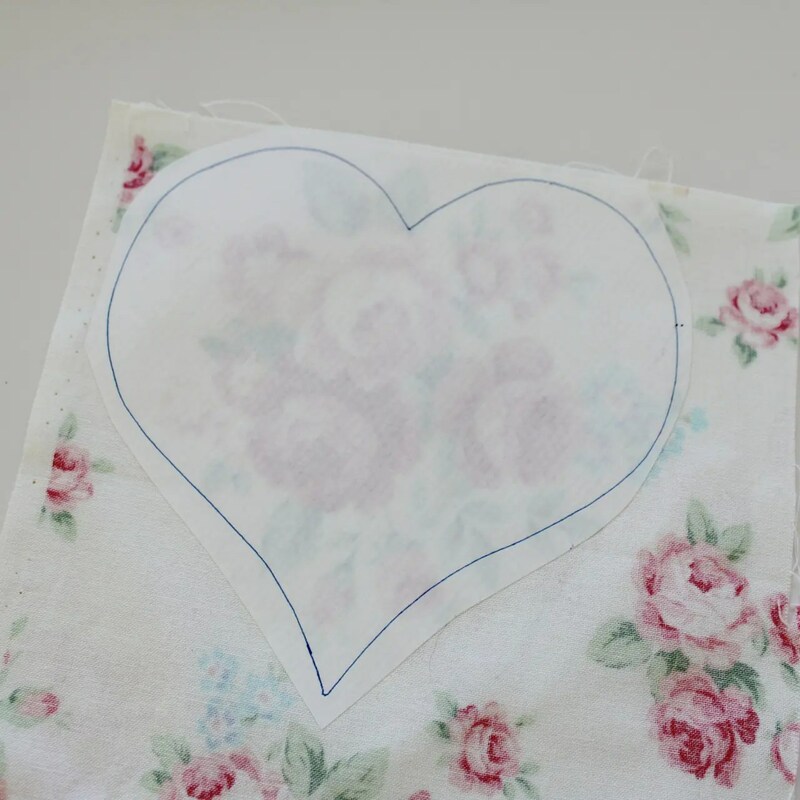 Trace your heart template onto the paper side of your fusible web. Roughly cut around your traced piece of fusible web ensuring you leave a small border. Do not cut on your drawn outline. Take some time to decide on the fabric you will use, and where you will position your fusible web. Take note of fabric that has a directional print or pattern. You don’t want the pattern to be upside down on your project. Try and always work with the grain so that the threads in the fabric run horizontal and vertical across the template (and not diagonally). And if the fabric has a light background, be sure your t-shirt colour won’t show through. Once you are happy with your fabric selection and placement, heat your iron to a hot non-steam setting. Place the fusible web piece onto the wrong side (the back) of your chosen fabric so that your template (on the paper side) is facing you and webbing is between the paper and the fabric. Fuse the paper to the fabric by running the hot iron over it for a few seconds. Follow your traced lines to neatly cut out your appliqué piece. Your heart is now ready to attach to your t-shirt. I like to make sure my appliqués are positioned in the centre front of the t-shirt and only an inch or two from the neckline. That way the design isn’t hidden if the t-shirt is tucked into a skirt or pants. When you are happy with your positioning, secure the appliqué fabric by going over it with a hot iron. The heat will ‘melt’ the bonding agent to secure your fabric piece to the garment or project fabric. 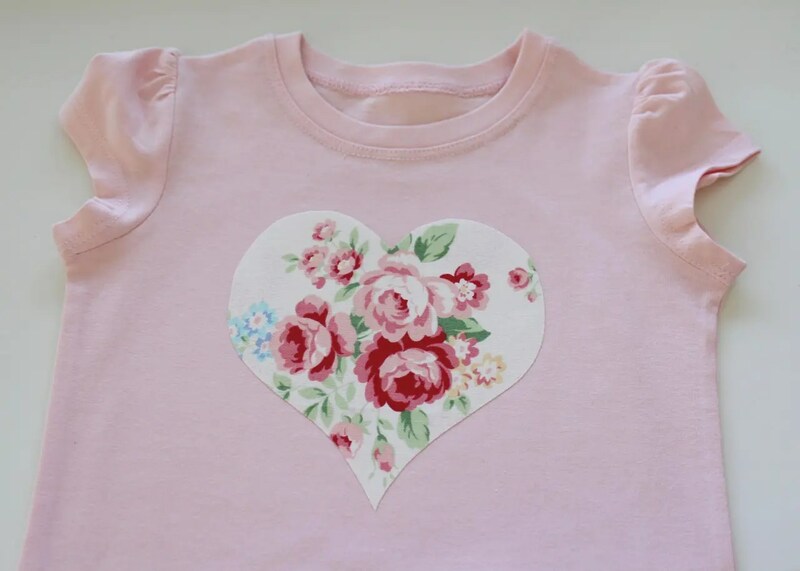 It’s time to blanket stitch around the raw edges of your appliqué design. 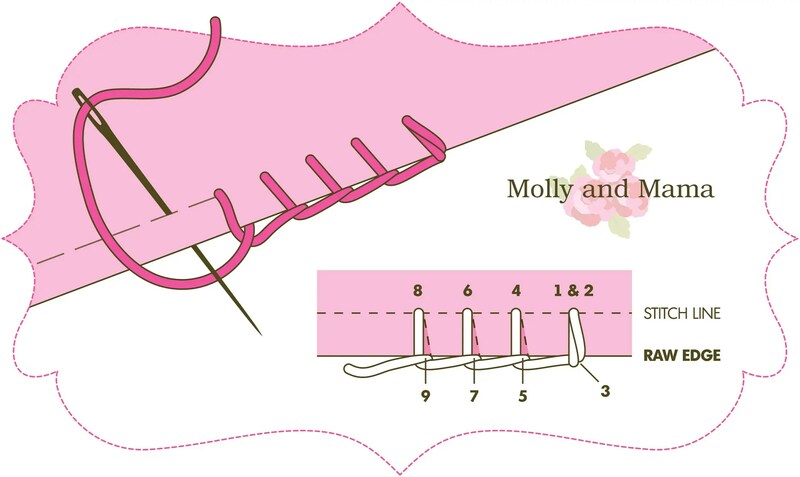 You can also use a satin stitch (which is a tight zig-zag stitch), or a straight stitch on the sewing machine. Choose a stitch you are comfortable with. However, I find that a blanket stitch protects the raw edges of the fabric and gives the neatest finish. I start stitching my hearts in the ‘bend’ at the top. That way, if there are any stitches that look untidy, they can be covered by the bow I add to finish the garment at the end. Try and use 100% cotton thread in your machine. If you are stitching by hand, use two strands of embroidery thread. Take your time blanket stitching. Pivot your needle or gently guide the fabric around as you stitch, so that your blanket stitch stays as close to the edge of your fabric as possible. 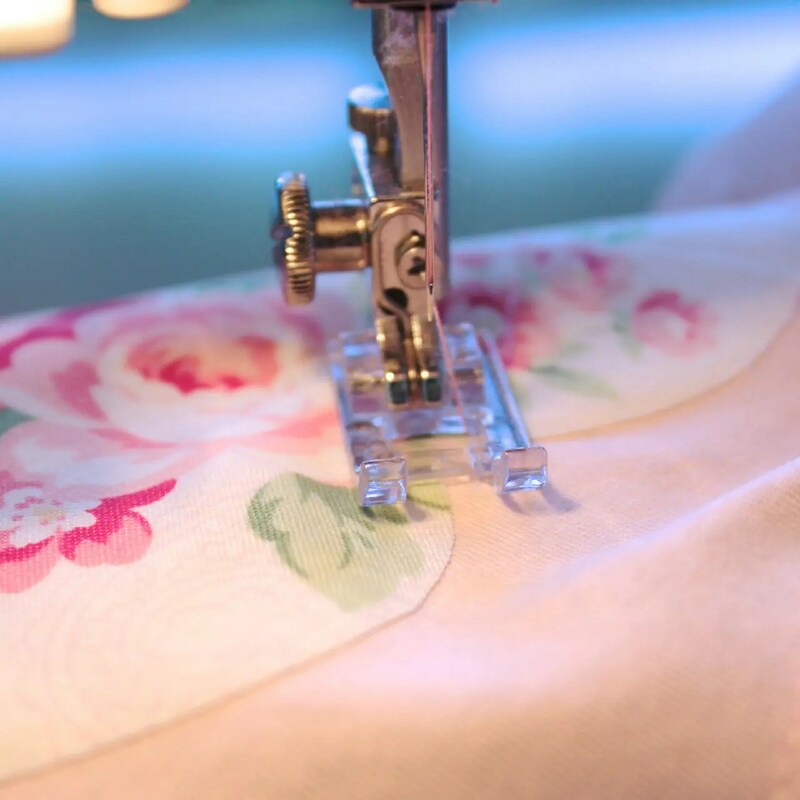 When you reach the base of the heart (when machine stitching), ensure your needle is down in the fabric, raise your foot, and pivot the fabric around so that you can easily navigate the corner. Lower your foot and continue to blanket stitch. Remember to secure your stitching well at the beginning and end (by back-stitching on the machine). Some people like to use stabilisers at the back of their appliqué to help ensure the t-shirt doesn’t stretch out of shape. However I have found that it’s not always necessary, and can sometimes get in the way. Practice first and see what works best for you. 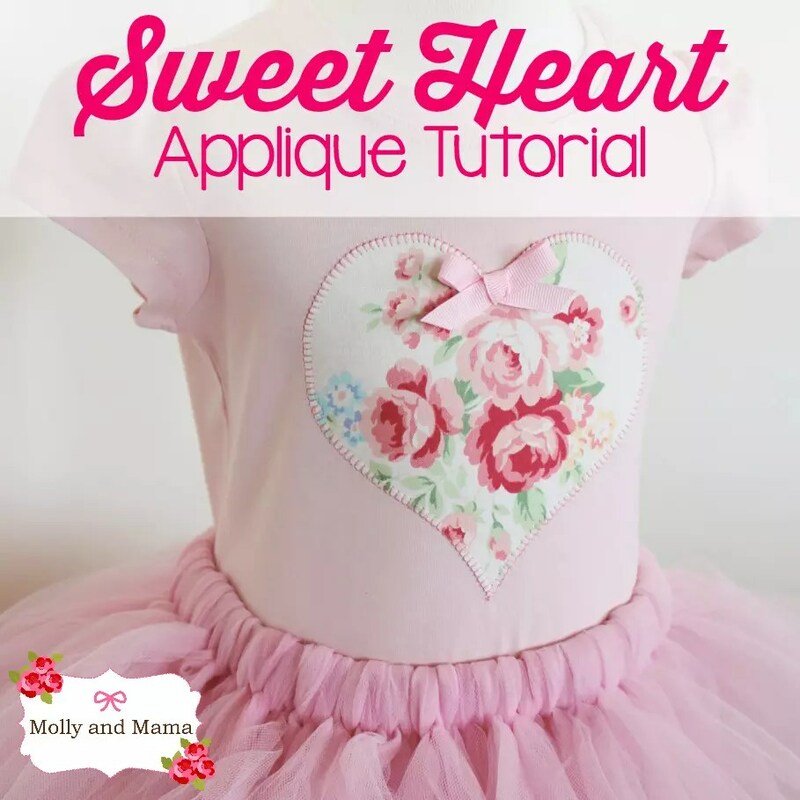 This heart doesn’t require embellishing, but you can add a button or a bow or both. Be sure to attach all embellishments securely. To add a bow, tie a small bow with some ribbon and trim the ends. Heat seal the ends with a heat sealing tool, or by quickly running a lighter flame along the cut edge of the ribbon to melt the fibres together. This ensures the bow doesn’t fray. Position the bow and secure it to the appliqué by hand stitching it firmly in place. Use sewing cotton in a similar colour to the bow. I prefer to disguise my stitches under the bow ends and loops so they can’t be seen. Here’s the finished t-shirt. All ready for a cute little miss to wear! And I have to say that I LOVE these when they’re teamed with a tutu! Take your time when you are stitching. Practice makes perfect! Most of all, have fun, enjoy it and practice, practice, practice! If you have any extra tips or tricks to add, I’d love to hear them. 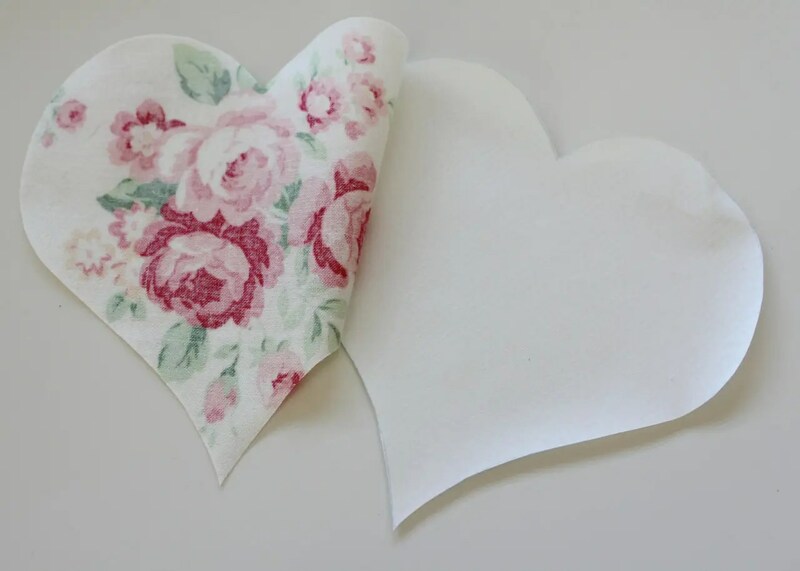 To see more heart inspired projects, pop by my Valentine’s Pinterest Board. Or you can see more appliqué ideas on Pinterest too! Adorable! I love the fabric and the colours, very beautiful. Thanks so much for your lovely feedback Eva! I’m glad you liked the project. This is such a pretty project! Thanks for sharing!